It didn’t start out bad. 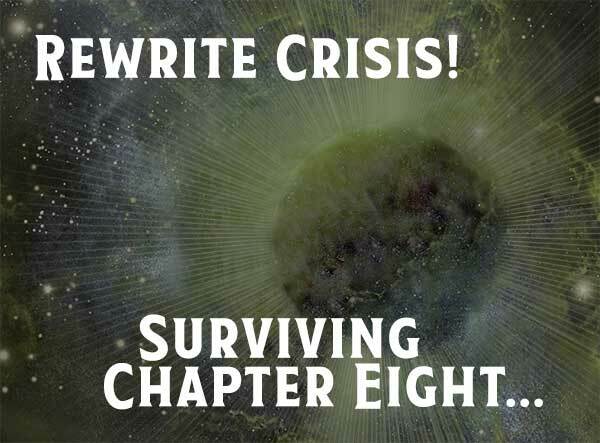 In fact, Chapter Eight was looking good at first. I was halfway through the chapter and I was rocking the word count at an alarming rate. But then, just as I was beginning to think I had the whole thing in the bag, things got weird. I felt lost. What the heck was going on? I was almost done! Now, this is where it gets interesting. I’m not new to feeling this resistance in my writing. It’s taken me a long time to come to terms with what it is. It’s gone by different names over the years: writer’s block, feeling off, loss of confidence, whatever… I’ve felt it before, but now something is different. Now I think I finally know what changed, that difference isn’t the feeling itself. The change isn’t so much within my writing, the change is me. I’ve now written enough to know that when I feel this resistance, when the challenge of writing feels insurmountable, it’s not because I can’t write. It’s because my writing is trying to speak to me. Or probably more accurately, my subconscious is trying to let me know that something isn’t adding up. In the past, this feeling would stop me in my tracks. I would lose all momentum and I would instantly start questioning myself, my capabilities, and my desire or will to continue… and that’s a tough battle for anyone to take on. Now I know that it isn’t personal. I have to learn to trust that intuitive sense. Something is off. Something isn’t right. And you know what? The answer is usually pretty simple. I just have to be in the frame of mind to look for it. The way this played out in Chapter Eight, is that I set up a reveal at the end of Chapter Six, but when it came time to write the next chapter in that story thread (Eight), I realized there were a few more elements of the story that needed to be developed. As I tried to move the story forward, there was a certain resistance, and not just within me. I could feel it in my characters and how they were trying to dance around this bombshell. Here it was, the perfect setup for a big reveal, and I was forcing them to tip-toe around it. The words might have come easy, but something was missing. Finding that missing piece was the key to moving forward. The good news is that I didn’t have to cut too many words, which is what I was really afraid of at first. After going back and rereading Chapter Six, I was able to get in tune with where my characters were at. It also helped me realize that a big part of what I’d written was still useful to the chapter. I just had to do a better job of setting it up. Going back and rediscovering that sense of balance was really key to unraveling what would have been a momentum-shattering problem not too long ago. Taking time to listen to my instincts and having faith in myself enough to give it another go when I just wanted to give up made all the difference. I’m not at words complete for the chapter just yet, but I’ve uncovered a great way forward and I’m really excited to see how the chapter is shaping up. So far, this rewrite has been such a great learning experience for me. I’m learning more about story and writing and myself than I expected and it’s been such an amazing journey. If you would like to check out the first chapter preview of Final Hope, please click here to read it now.